Keshipour, S., Adak, K. (2018). Reduction of Nitroaromatics to Amines with Cellulose Supported Bimetallic Pd/Co Nanoparticles. Iranian Journal of Chemistry and Chemical Engineering (IJCCE), 37(3), 23-31. Sajjad Keshipour; Kamran Adak. "Reduction of Nitroaromatics to Amines with Cellulose Supported Bimetallic Pd/Co Nanoparticles". 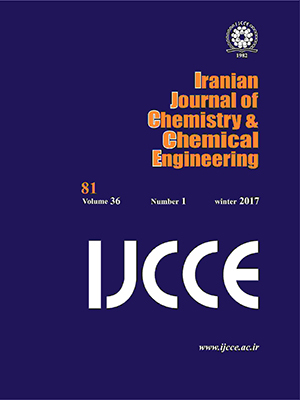 Iranian Journal of Chemistry and Chemical Engineering (IJCCE), 37, 3, 2018, 23-31. Keshipour, S., Adak, K. (2018). 'Reduction of Nitroaromatics to Amines with Cellulose Supported Bimetallic Pd/Co Nanoparticles', Iranian Journal of Chemistry and Chemical Engineering (IJCCE), 37(3), pp. 23-31. Keshipour, S., Adak, K. Reduction of Nitroaromatics to Amines with Cellulose Supported Bimetallic Pd/Co Nanoparticles. Iranian Journal of Chemistry and Chemical Engineering (IJCCE), 2018; 37(3): 23-31. Pd and Co nanoparticles were deposited on cellulose for use as a heterogeneous catalyst in the bimetallic catalytic reduction reaction. The catalyst was characterized with Energy Dispersive X-Ray Spectroscopy, X-Ray Diffraction pattern, Thermal Gravimetric Analysis, Flame Atomic Absorption Spectroscopy, and Transmission Electron Microscopy, and applied in the reduction reaction of nitroaromatics using NaBH4 at room temperature. Aromatic amines were obtained as the sole product of the reduction reaction during 2h. This reaction has some advantages such as mild reaction conditions, high yield, green solvent, and recyclable catalyst. Also, the recovered catalyst is applicable in the reduction reaction for 4 times without a significant decrease in the activity. Kiasat A.R., Zayadi M., Mohammad-Taheri F., Fallah-Mehrjard M., Simple, Practical and Eco-friendly Reduction of Nitroarenes with Zinc in the Presence of Olyethylene Glycol Immobilized on Silica Gel as a New Solid–liquid Phase Transfer Catalyst in Water, Iran. J. Chem. Chem. Eng. (IJCCE), 30(2): 37-41 (2011). Wienhöfer G., Sorribes I., Boddien A., Westerhaus F., Junge K., Junge H., Llusar R., Beller M., General and Selective Iron-catalyzed Transfer Hydrogenation of Nitroarenes Without Base, J. Am. Chem. Soc., 133(32): 12875-12879 (2011). Kelly S.M., Lipshutz B.H., Chemoselective Reductions of Nitroaromatics in Water at Room Temperature, Org. Lett., 16(1): 98-101 (2014). Yuste F., Saldana M., Walls F., Selective Reduction of Aromatic Nitro Compounds Containing o- and n-Benzyl Groups With Hydrazine and Raney Nickel, Tetrahedron Lett., 23(2): 147-148 (1982). Ram S., Ehrenkaufer R.E., A General Procedure for Mild and Rapid Reduction of Aliphatic and Aromatic Nitro Compounds Using Ammonium Formate as a Catalytic Hydrogen Transfer Agent, Tetrahedron Lett., 25(32): 3415-3418 (1984). Di Gioia M.L., Leggio A., Le Pera A., Liguori A., Napoli A., Perri F., Siciliano C., Determination by Gas Chromatography/Mass spectrometry of p-Phenylenediamine in Hair Dyes After Conversion to an Imine Derivative, J. Chromatogr. A, 1066(1-2): 143-148 (2005). Larock R.C., “Comprehensive Organic Transformations”, VCH: New York, 411–415 (1989). Kabalka G.W., Varma R.S., In: “Comprehensive Organic Synthesis”, Trost B.M., Fleming I., (Eds. ); Pergamon Press: Oxford, Vol. 8, 363–379 (1991). Sauvé G. Rao V.S., In: “Comprehensive Organic Functional Group Transformations”, Katritzky A.R., Meth-Cohn O., Rees C.W., (Eds. ); Pergamon Press: Oxford, Vol. 2, pp 737–817 (1995). Gowda S., Abiraj K., Gowda D.C., Reductive Cleavage of Azo Compounds Catalyzed by Commercial Zinc Dust Using Ammonium Formate or Formic Acid, Tetrahedron Lett., 43(7): 1329-1331 (2002). Sharma U., Kumar P., Kumar N., Kumar V., Singh B., Highly Chemo- and Regioselective Reduction of Aromatic Nitro Compounds Catalyzed by Recyclable Copper(II) as Well as Cobalt(II) Phthalocyanines, Adv. Synth. Catal., 352(11-12): 1834-1840 (2010). Junge K., Wendt B., Shaikh N., Beller M., Iron-Catalyzed Selective Reduction of Nitroarenes to Anilines Using Organosilanes, Chem. Commun., (10): 1769-1771 (2010). Sharma U., Kumar N., Verma P.K., Kumar V., Singh B., Zinc Phthalocyanine with PEG-400 as a Recyclable Catalytic System for Selective Reduction of Aromatic Nitro Compounds,Green Chem., 14(8): 2289-2293 (2012). Stiles M., Finkbeiner H.L., Chelation as a Driving Force in Synthesis. A New Route to α-Nitro Acids and α-Amino Acids, J. Am. Chem. Soc., 81(2): 505-506 (1959). Uberman P.M., García C.S., Rodríguez J.R., Martín S.E., PVP-Pd Nanoparticles as Efficient Catalyst for Nitroarene Reduction under Mild Conditions in Aqueous Media, Green Chem., 19(3): 739-748 (2017). Dowing R.S., Kunkeler P.J., Van Bekkum H., Catalytic Syntheses of Aromatic Amines, Catal. Today, 37(2): 121-136 (1997). Corma A., Serna P., Concepcion P., Calvino J., Transforming Nonselective into Chemoselective Metal Catalysts for the Hydrogenation of Substituted Nitroaromatics, J. Am. Chem. Soc., 130(27): 8748-8753 (2008). Blaser H.U., Steine H., Studer M., Selective Catalytic Hydrogenation of Functionalized Nitroarenes: An Update, Chem. Cat. Chem., 1(2): 210-221 (2009). Burk S.D., Danheiser R.L., “Handbook of Reagents for Organic Synthesis, Oxidizing and Reducing Agents”, Wiley-VCH: New York (1999). Satoh T., Suzuki S., Miyaji Y., Imai Z., Reduction of Organic Compounds with Sodium Borohydride-transition Metal Salt Systems: Reduction of Organic Nitrile, Nitro and Amide Compounds to Primary Amines, Tetrahedron Lett., 10(52): 4555-4558 (1969). Yoo S., Lee S., Reduction of Organic Compounds with Sodium Borohydride-copper(II) Sulfate System, Synlett, (7): 419-420 (1990). Osby J.O., Ganem B., Rapid and Efficient Reduction of Aliphatic Nitro Compounds to Amines, Tetrahedron Lett., 26(52): 6413-6416 (1985). Guo F., Ni Y., Ma Y., Xiang N., Liu C., Flowerlike Bi2S3 Microspheres: Facile Synthesis and Application in the Catalytic Reduction of 4-Nitroaniline, New J. Chem., 38(11): 5324-5330 (2014). Wu F., Qiu L.G., Ke F., Jiang X., Copper Nanoparticles Embedded in Metal–organic Framework MIL-101(Cr) as a High Performance Catalyst for Reduction of Aromatic Nitro Compounds. Inorg. Chem. Commun., 32: 5-8 (2013). Németh J., Kiss Á., Hell Z., Palladium-catalysed Transfer Hydrogenation of Aromatic Nitro Compounds - An Unusual Chain Elongation, Tetrahedron Lett., 54(45): 6094-6096 (2013). Obraztsova I.I., Eremenko N.K., Simenyuk G.Y., Eremenko A.N., Tryasunov B.G., Bimetallic Catalysts for the Hydrogenation of Aromatic Nitro Compounds, Solid Fuel Chem., 46(6): 364-367 (2012). Sheikhhosseini E., Sattaei Mokhtari, T., Faryabi M., Rafiepour A., Soltaninejad S., Iron Ore Pellet, A Natural and Reusable Catalyst for Synthesis of Pyrano[2,3-d]pyrimidine and Dihydropyrano[c] chromene Derivatives in Aqueous Media, Iran. J. Chem. Chem. Eng. (IJCCE), 35(1): 43-50 (2016). Mohammadi Ziarani G., Badiei A.R., Khaniania, Y., Haddadpour M., One Pot Synthesis of Polyhydroquinolines Catalyzed by Sulfonic Acid Functionalized SBA-15 as a New Nanoporous Acid Catalyst Under Solvent Free Conditions, Iran. J. Chem. Chem. Eng. (IJCCE), 29(2): 1-10 (2010). Keypour H., Noroozi M., Rashidi A., Shariati Rad M., Application of Response Surface Methodology for Catalytic Hydrogenation of Nitrobenzene to Aniline Using Ruthenium Supported Fullerene Nanocatalyst, Iran. J. Chem. Chem. Eng. (IJCCE), 34(1): 21-32 (2015). Saadatjou N., Jafari A., Synthesis and Characterization of Ru/Al2O3 Nanocatalyst for Ammonia Synthesis, Iran. J. Chem. Chem. Eng. (IJCCE), 34(1): 1-9 (2015). Habibi Y., Lucia L.A., Rojas O.J., Cellulose Nanocrystals: Chemistry, Self-assembly, and Applications, Chem. Rev., 110(6): 3479-3500 (2010). Reddy K.R., Kumar N.S., Cellulose-supported Copper(0) Catalyst for Aza-michael Addition, Synlett, (14): 2246-2250 (2006). Cirtiu C.M., Dunlop-Brière A.F., Moores A., Cellulose Nanocrystallites as an Efficient Support for Nanoparticles of Palladium: Application for Catalytic Hydrogenation and Heck Coupling Under Mild Conditions, Green Chem. 13(2): 288-291 (2011). Keshipour S., Shojaei S., Shaabani A., Palladium Nano-particles Supported on Ethylenediaminefunctionalized Cellulose as a Novel and Efficient Catalyst for the Heck and Sonogashira Couplings in Water, Cellulose, 20(2): 973-980 (2013). Keshipour S., Shaabani A., Copper(I) and Palladium Nanoparticles Supported on Ethylenediamine-functionalized Cellulose as an Efficient Catalyst for the 1,3-Dipolar Cycloaddition/Direct Arylation Sequence, Appl. Organometal. Chem., 28(2) 116-119 (2014). Keshipour S., Kalam Khalteh N., Oxidation of Ethylbenzene to Styrene Oxide in the Presence of Cellulose-Supported Pd Magnetic Nanoparticles, Appl. Organometal. Chem., 30(8) 653-656 (2016). Shaabani A., Keshipour S., Hamidzad M., Seyyedhamzeh M., Cobalt(II) Supported on Ethylenediamine-functionalized Nanocellulose as an Efficient Catalyst for Room Temperature Aerobic Oxidation of Alcohols, J. Chem. Sci., 126(1): 111-115 (2014). Shaabani A., Keshipour S., Hamidzad M., Shaabani S., Cobalt(II) Phthalocyanine Covalently Anchored to Cellulose as a Recoverable and Efficient Catalyst for the Aerobic Oxidation of Alkylarenes and Alcohols, J. Mol. Catal. A Chem., 395: 494-499 (2014). Keshipour S., Khezerloo M., Gold Nanoparticles Supported on Cellulose Aerogel as a New Efficient Catalyst for Epoxidation of Styrene, J. Iran. Chem. Soc., 14(5): 1107–1112 (2017). Keshipour S., Adak K., Pd(0) Supported on N-doped Graphene Quantum Dot Modified Cellulose as an Efficient Catalyst for the Green Reduction of Nitroaromatics. RSC Adv., 6(92): 89407–89412 (2016). Nandi D., Siwal S., Choudhary M., Mallick K., Carbon Nitride Supported Palladium Nanoparticles: An Active System for the Reduction of Aromatic Nitro-compounds, Appl. Catal. A Gen., 523: 31-38 (2016). Kumar P.S., Lokanatha Rai K.M., Reduction of Aromatic Nitro Compounds to Amines Using Zinc and Aqueous Chelating Ethers: Mild and Efficient Method for Zinc Activation, Chem. Pap., 66(8): 772-778 (2012). Zhao Z., Yang H., Li Y., Guo X., Cobalt-modified Molybdenum Carbide as an Efficient Catalyst for Chemoselective Reduction of Aromatic Nitro Compounds, Green Chem., 16(3): 1274-1281 (2014). Wen H., Yao K., Zhang Y., Zhou Z., Kirschning A., Catalytic Transfer Hydrogenation of Aromatic Nitro Compounds in Presence of Polymer-supported Nano-amorphous Ni–B Catalyst, Catal. Commun., 10(8): 1207-1211 (2009). Zamani F., Kianpour S., Fast and Efficient Reduction of Nitro Aromatic compounds Over Fe3O4/β-Alanine-acrylamide-Ni Nanocomposite as a New Magnetic Catalyst, Catal. Commun., 45(5): 1-6 (2014).